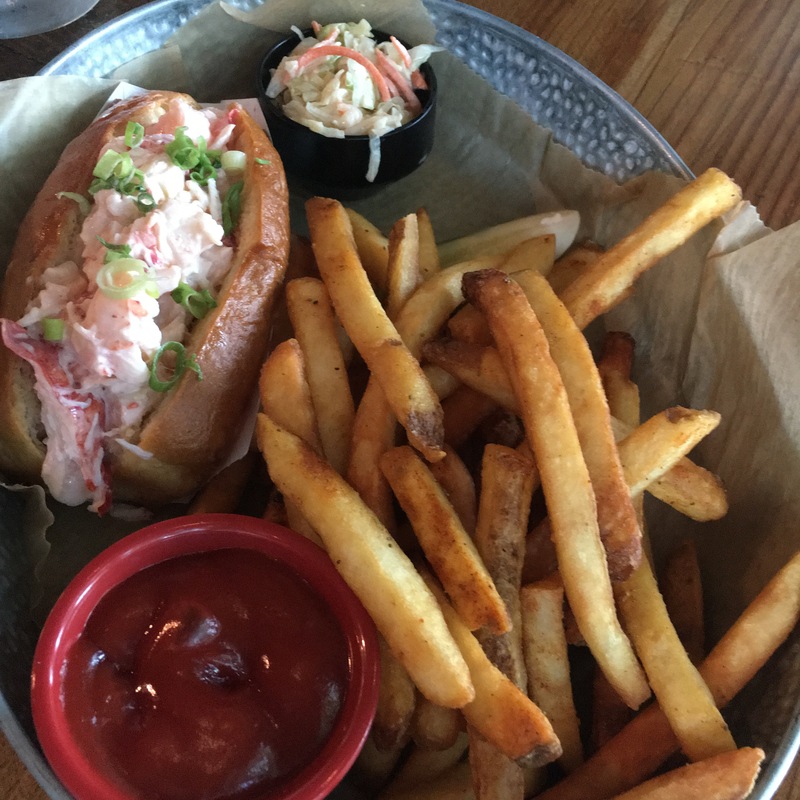 The Alexandria Restaurant Partners, owners of The Majestic, Virtue Feed and Grain and Lena’s Wood-Fired Pizza & Tap opened their latest eatery in Alexandria a few months ago…Vola’s Dockside Grill and Hi-Tide Lounge. With the dog days of August on us, eating dockside food seems to be a natural. For those really hot days there is a spacious air-conditioned restaurant and bar and for those wonderful cooler days, there is ample outdoor seating along the waterfront. Attached to the restaurant is the Hi-Tide Lounge where the island theme prevails with signature rum and other cocktails. It is called the Hi-Tide Lounge because when the Potomac River has an unusually high tide – particularly combined with a heavy rain upstream – the river rises and backs up the storm drains into the streets of Old Town. Hi-Tide Lounge sits about 6 feet above the street and is safe from rising water. This is fast becoming not only a favorite gathering place for locals but also for private parties. 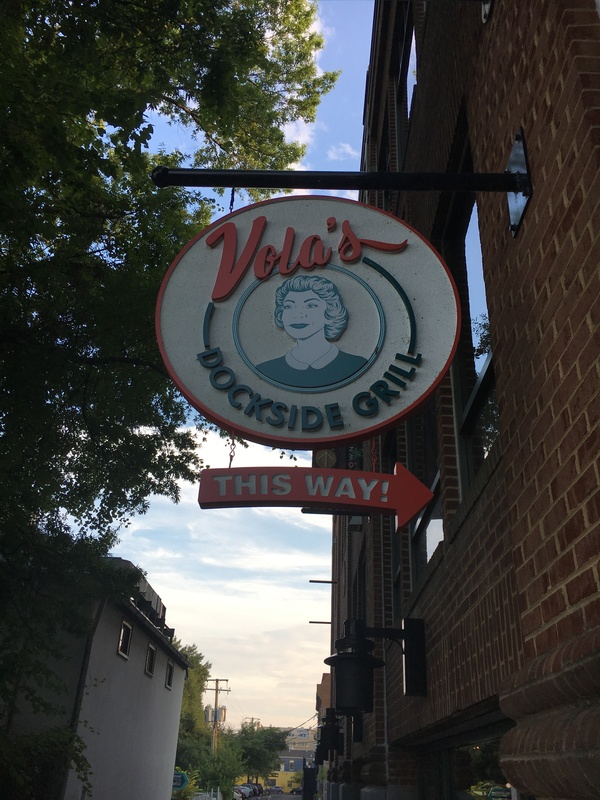 Vola’s is named after Vola Lawson, a community activist who was Alexandria’s City Manager from 1985 to 2000. Vola helped to stabilize the city’s finances and make Alexandria what it is today. The local animal shelter is also named after Lawson due to her long time fight for animal rights. Today the restaurant continues to support many of Lawson’s causes including hosting regular fundraisers for animal rescue groups. The main restaurant sports a large bar of about 25 seats and there are photographs from the past throughout the restaurant. Besides great drinks, the bar also serves lunch and dinner. On our night there we were seated at an indoor table with a window view of the patio. We started out with their signature conch fritters with key lime mustard sauce and chipotle cocktail sauce. This is a popular island dish made famous in the Florida Keys. Not being too familiar with conch fritters, I thought these hushpuppy type bites were full of flavor and a few strips of conch, which is chewy, like clams, a favorite of mine. Other appetizers include Smoked Fish Dip, Crab Dip, Fried Calamari and Vola’s favorite…Deviled Eggs & Bacon. Oysters are a biggie at Vola’s. They bring in local oysters daily and offer different selections from around the region with half-price on selected oysters Monday through Friday from 3-6pm. Vola’s also serves brunch on Saturday and Sunday. 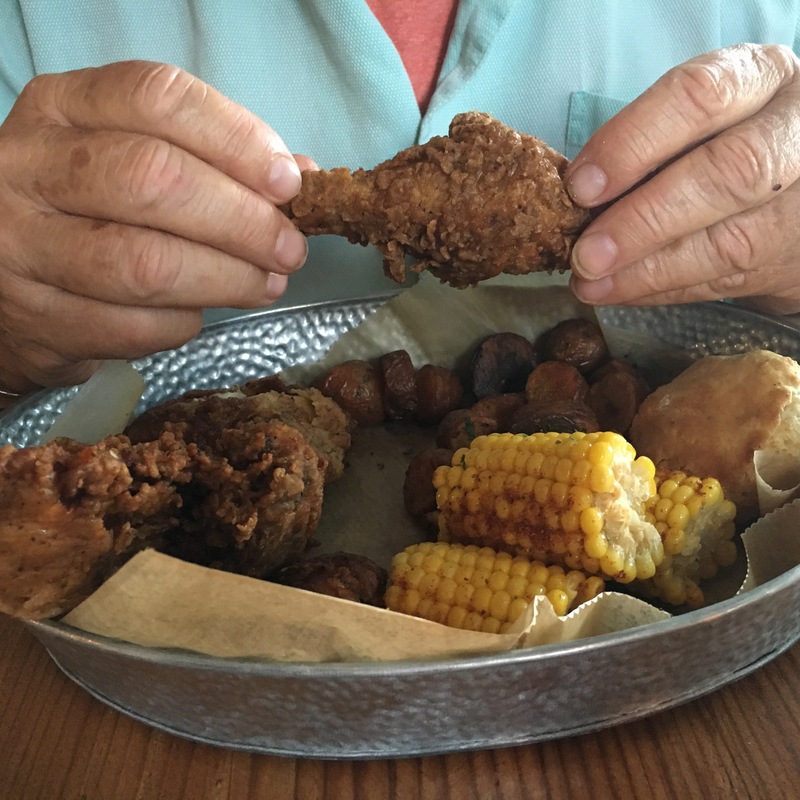 For my entrée I ordered the Crispy Fried Chicken with maple-black pepper buttermilk biscuit, roasted fingerling potatoes and corn on the cob. The chicken was very moist due to pressure-cooking and then deep-frying. The coating was thick and crunchy which is just how I like it. The fingerling potatoes were cooked to a deep brown color and tender throughout. I would have preferred white sweet corn rather than the yellow corn that was served, however it was very good. For dessert I couldn’t pass up the key lime pie. 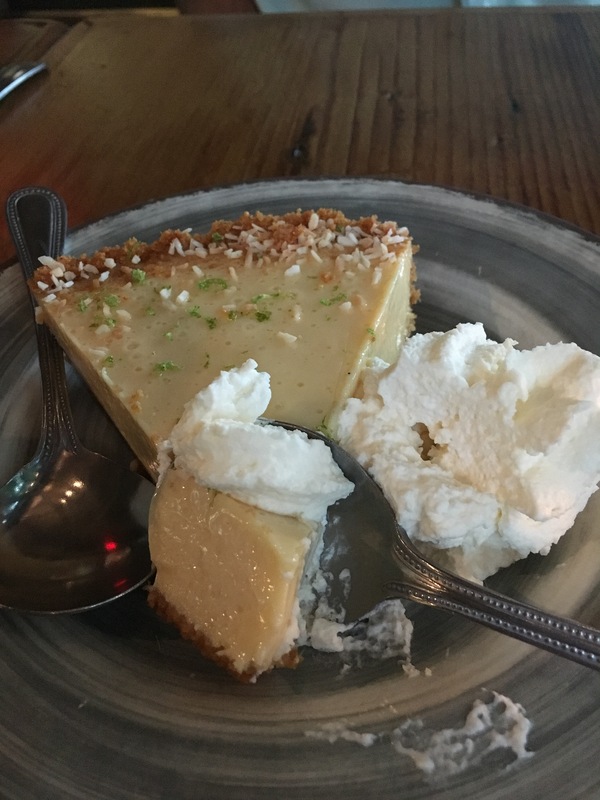 A firm pie filling that was loaded with flavor and little pieces of lime zest on a delicious graham cracker crust topped with a dollop of house made whipped cream. This was a perfect ending and brought back memories of my younger days. The menu isn’t over whelming and has a great variety of offerings that cover a taste for everyone. They have a variety of beers and a wine list that isn’t extensive but perfect for this restaurant. The specialty drinks featured at Hi-Tide Lounge are all available in the restaurant as well. Vola’s serves lunch and dinner and hosts brunch on Sundays. Check out the details at volasdockside.com.